Metasploit is one of the best pentesting tool for exploitation and injecting shell codes and it’s part of almost every hacking toolkit. So today we’re going to make our Mac setup for hacking. Now the Metasploit Framework has an install package for macOS (previously called Mac OS X). Of course, you can get Metasploit and other hacking tools pre-installed on Kali Linux, but I generally prefer installing tools on your MacOS it generally run faster then using on VM, I only use Kali Linux on VM when there’s no tools available for MacOS. First you need to download a package here, Once it is downloaded, open the package and follow steps to properly install metasploit. Click Continue and install metasploit. Now, that you’re down with installation it’s time to configure your metasploit installation, to do that follow me. 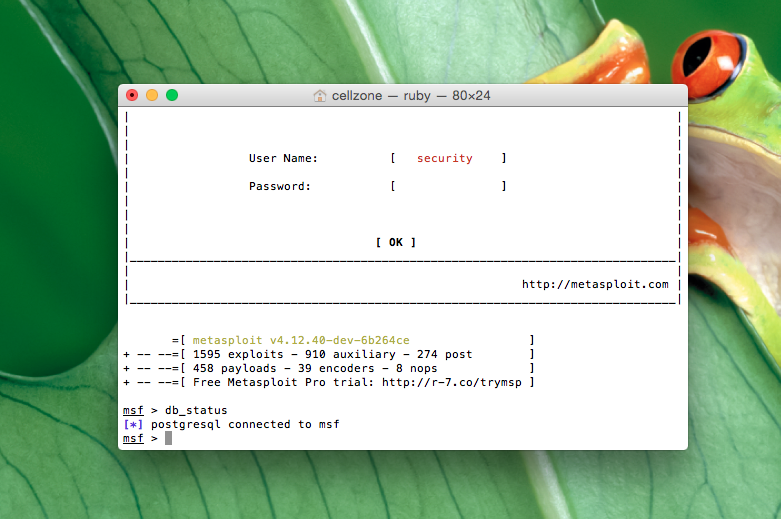 First open up your terminal and change the directories to that folder where you install metasploit. You will be asked if you want to set up a new database. Installing the database will allow us to list credentials, list hosts, and more—which is what we want. Once the database is set up, msfconsole will drop you into the msfconsole! The install is complete. As you can see database is working and connected, and your done installing metasploit. First thing to make sure after installing is update, keep your metasploit updated by running this command. Installing Metasploit on MacOS never been so easier, Before we used to run bunch of commands and setting things manually now it’s installing a setup and done! If you still got any questions don’t forget to contact us on our community.